Manam (Papua New Guinea): (26 Apr) Volcanic Ash Advisory Center Darwin (VAAC) issued the following report: VA OBS TO FL100 MOV WSW EXT 20NM AT 26/0040Z. Langila (New Britain, Papua New Guinea): (25 Apr) Volcanic Ash Advisory Center Darwin (VAAC) issued the following report: VA OBS TO FL070 MOV E AT 25/2130Z. 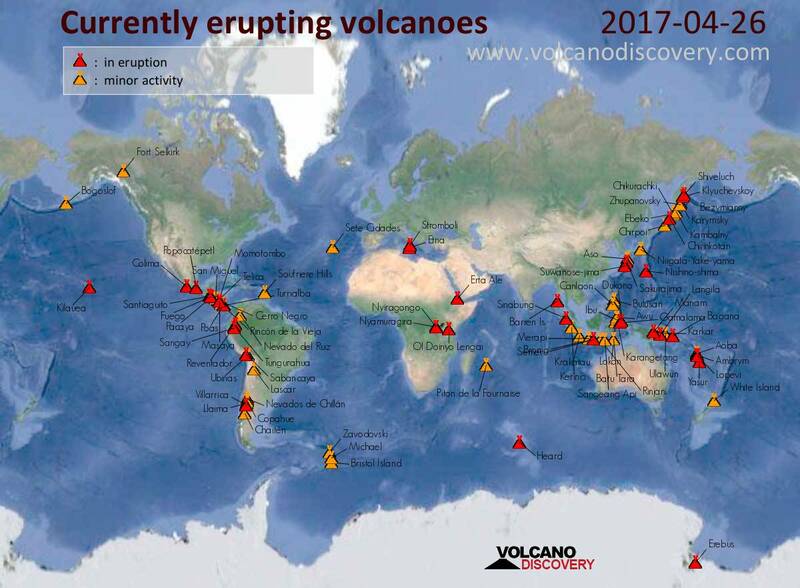 Ibu (Halmahera, Indonesia): (26 Apr) Volcanic Ash Advisory Center Darwin (VAAC) issued the following report: ERUPTION TO FL050 MOV NE AT 26/0017Z. Sinabung (Sumatra, Indonesia): (26 Apr) Volcanic Ash Advisory Center Darwin (VAAC) issued the following report: ERUPTION TO FL110 MOV SW AT 26/0134Z.